PLEASE READ THE EXPANDED DESCRIPTION! 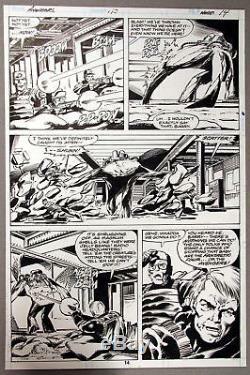 Original art for Avengers 190, page 14, by John Byrne (pencils) and Dan Green (inks), published December 1979 by Marvel. You pay what we pay! Also, please be aware that. It's a violation of the law and if the package is lost or damaged, we'd only be reimbursed the declared amount instead of the actual value. Gary Dolgoff Comics 116 Pleasant St Suite 213 Easthampton MA 01027 USA. NOTE REGARDING IMAGERY OF OUR ITEMS. Our goal is to represent our items as honestly as possible, including all existing flaws and anomalies. That being said, select images we provide do not always show some of the smaller faults that a given item may have. In order to address this, we will often mention these particulars in the description when we feel that it is pertinent. The vast majority of our images are provided raw and unedited. We will only edit an items images when we feel the pictures/scans appear different in quality than the item itself then, well only edit a given image in an attempt to make it appear as close to the original as possible. This is rarely necessary, but is much more frequent for certain categories. For example, original comic artwork often requires color/contrast correction. Be sure to add "gdcomics" to your favorites. The item "ORIGINAL ART, AVENGERS #190, PG 14, JOHN BYRNE, DAN GREEN, GREY GARGOYLE vs NYPD" is in sale since Wednesday, October 25, 2017.